From your answers to this quiz, it appears that you grew up lacking a Sense of Self. This happens when a person grows up with parents or caregivers who don’t truly see and acknowledge their child as an autonomous being as opposed to (unknowingly) being considered an extension of themselves. This is also commonly known as "childhood emotional neglect." People who grow up without a Sense of Self often feel invisible and unappreciated. You likely find it difficult to express your authentic feelings and personal preferences. You may struggle with depression and/or anxiety with a deep-seated feeling that you are not “good enough” or that there is something different about you. These are common symptoms of those who lack a Sense of Self. In childhood, many people who lack a sense of Self develop a survival mechanism to feel better about themselves. We call it a Substitute Sense of Self (SSoS), and it’s based on pleasing others. If left undiscovered and unchanged, it can lead to living your life based on other people’s approval and other people’s expectations of you. When you live your life in that way it doesn’t feel good. It’s not authentic. It’s not the real YOU. It can cause extreme stress, anxiety, and depression. It can set you up for failure in relationships and in your career. What’s worse is that if you grow up without a sense of Self your children will likely experience the same because our conditioning in childhood runs as a subconscious program unless we take active steps to change it. This is where we can help you. 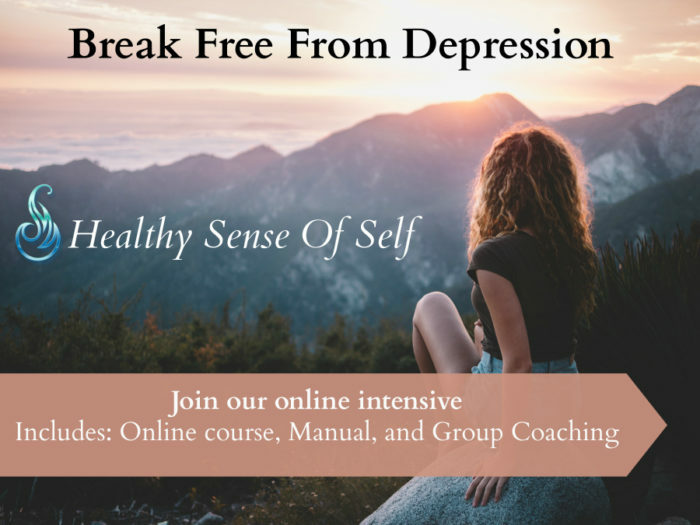 The Sense of Self Method is designed for people who lack a sense of Self to connect you with who you truly are and what you want from your life. Although it may feel impossible right now you really can experience lasting happiness and fulfillment. Depression, anxiety, insomnia, and other symptoms can be a thing of the past. You can begin the process of restoring your sense of Self by taking our online course and reading our books. Together these tools are an invaluable resource for making you feel better! Your mental health and emotional well-being are priceless. It’s the most important thing you can do for yourself. We are confident that this program can help you. The investment in yourself is risk-free and if our method doesn't work for you, we'll honor a full refund. Are you ready to start living a life that's truly yours? Register today for the Sense of Self Course for only $297!